Let's bring the tradition of Buon Fresco from Italy to America. With your patronage, we can resurrect this historic method of Renaissance painting and utilize it to adorn this great country. Buon Fresco is the art of painting on fresh lime plaster instead of dry wall or canvas using pigment mixed with water. The application of paint to the wet surface allows the pigment to create a stronger bond with the lime. The look, feel, sustainability and durability are incomparable to any other form of art (no aerosols/no v.o.c’s). Traditional Fresco is painted on fresh plaster troweled over brick. To begin we need a plain brick wall which would serve as our blank canvas. 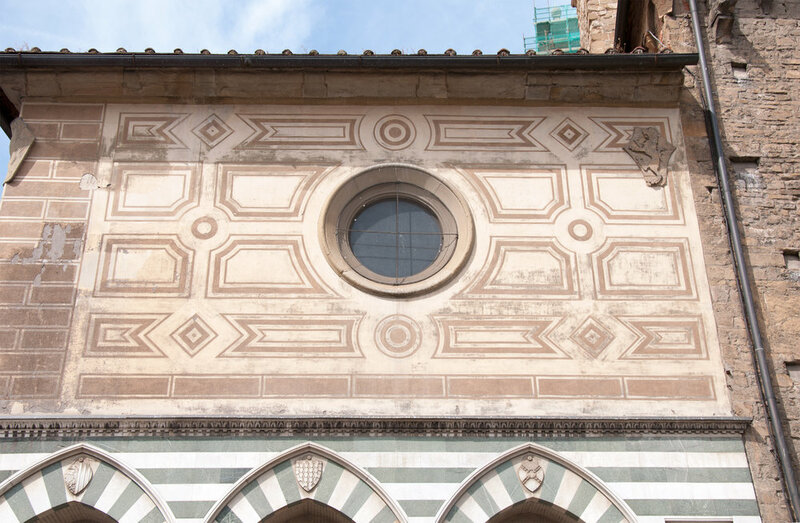 Here's a beautiful example of an elegant fresco design on the exterior of an apartment building in Italy. Although executed using only 3 colors (white, light ochre and umber) the fresco is quite ornate. Even the simplest of fresco designs can transform the look and feel of a space, adding an elevated sense of culture and refinement.